Nestled in the unspoiled hills of Knox County is Apple Valley Lake. The perfect place for living the American dream. Beautiful homes line the shoreline or perch on the hills above, offering a view of the sparkling water, winding country roads, and apple trees in bloom. Apple Valley Lake is a planned development created by American Paper Company. Construction began in 1970 and the lake first reached full pool in 1972. Of the total 3, 770 acres in the development, 511 acres are under water forming a lake 3 1/4 miles long with 9.5 miles of shoreline. All the lots have been sold and approximately 2700 homes have been built on the over 6,600 lots. Prices of homes vary from $80,000 to more than $750,000. Lakefront/waterfront homes begin at $250,000 and come in all sizes, shapes and descriptions. Most lakefront lots are already developed, however, a few lots are available beginning at $230,000, lake access lots in Coves and Canals begin at $75,000. Many excellent building lots are available. It is said that Apple Valley Lake is the cleanest lake in Ohio. There are two reasons for this. First, every lot has county sewer and water available. No home is connected to a septic tank and therefore there is no leaching into the lake. Secondly, the lake is deep. At the dam the depth is over 65 feet, most of the lake runs about 50 feet deep in the middle and the average depth is 35 feet over all. 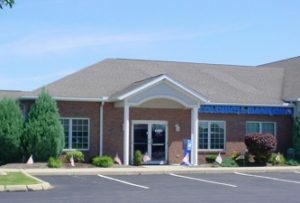 Coldwell Banker Quest has been Serving Apple Valley/Knox County Ohio and surrounding areas for over 34 years. Our diverse team offers agents specializing in residential, farms, vacant ground, resort, commercial, investment and historic properties, along with auctioneering services. We have 14 agents with diverse expertise and knowledge ready to serve you! Coldwell Banker Quest is known for overall highest satisfaction for service to buyers and sellers. We are a real estate “team” that cares about you and their community. Apple Valley/Knox County fosters an environment supportive of both careers and family with a wide range of amenities for everyone. Contact us today for all your Real Estate needs.